You will not believe just how feather-light these earrings are. The light and shine of the encrusted Swarovski crystals ornate this silver filigree piece. 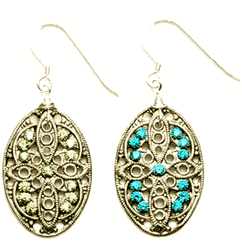 These delightful earrings dangle 1.5" from sterling silver French hooks (0.75"diameter).